Cod — The Local Catch, Inc. - The Best Rhode Island Seafood! Click here for our Cod recipes. Biology: Atlantic cod is found on the sea bottom from Greenland to North Carolina. 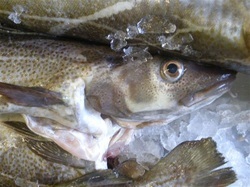 In the New England area, cod belong to two distinct breeding stocks -- the Georges Bank stock and the Gulf of Maine stock. Cod are a top predator in bottom communities, feeding on invertebrates, lobsters, and fish. Adult cod have few predators. They can reach 6 1/2 feet and age up to 30 years. Sustainability status: Both cod stocks experienced steep stock declines in the 1990s, but the Gulf of Maine stock is coming back and is no longer considered overfished. More information is available here. Harvest: Cod are caught using bottom trawls, longlines, fish pots, and rod and reel. Nutritional facts: Cod are a good source of protein, phosphorous, niacin, and vitamin B12. A 100-gram portion of cod contains 17.81 grams of protein, 33.1 mcg selenium, 82 calories, 0.67 grams of fat, 43 mg cholesterol, and 54 mg sodium.